Take a left and enter Tin Town, the town where many robots call home. Bring your robots to life as you play your way through 5 reels to play slot online springs, nails and batteries and maximise your profits across 25 paylines of mechanical cash fun. Eyecon was founded in 1997 and proceeded to quickly make the adaptation to the online circuit in 1999. Recently celebrating 20 years in the online casino industry they have brought gamers more than 70 unique and industry defining titles. Each instalment holds a unique theme and style, covering subjects from stuffed animals in Fluffy Favourites to the legends of Egypt in Temple of Isis. With a range from bingo to video slots, there is something for every style of gaming within their illustrious collection. The vigour of this portfolio has recently seen Eyecon join the iconic Playtech family, only strengthening this brand further. 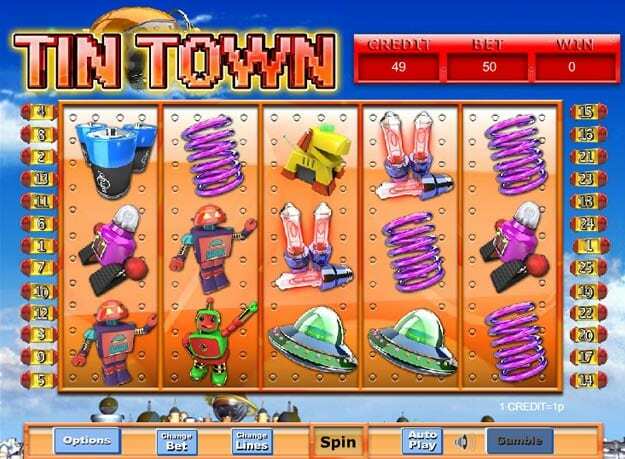 Tin Town takes the form of a 5-reel, 25 payline slot machine holding 15 robotics themed symbols. It is one of the most popular online slots games. Players will begin to earn cash payouts when 3 or more symbols are matched within a singular payline. To make the most out of Tin Town, players should choose to activate all the 25 available pay lines with their stake. This will produce the best opportunity to win as only symbols in active paylines will count towards cash prizes. The combination of the illustrative robots with the Tin Town motifs ensure this Eyecon instalment transports players to an entirely new world. One of the most sought after symbols within the game is known as the Dancebot, Dancebot acts as a Wild, meaning it can replace any other none bonus symbols to help players form a winning payline. Additional to being the perfect replacement for other symbols, if players manage to match 5 of these in a singular payline they will hit a glorious 9,500 jackpot. But that is still not the end of Dancebots uses, when this character is on screen and another match is made, an added bonus win will join the final cash payout, for example; 5 springs in a row will grant players 100 coins, but 5 springs with the addition of a Dancebot will grant players a staggering 200 coins. Another useful metallic friend is Dogbot, acting as this games Scatter accumulating 3 or more of these in any position within the reel will trigger a minimum of 15 Free Spins. During the Free Spin rounds, players are not only playing without an initial wager but every win will obtain an x2 multiplier, doubling each payout and possibly making Dogbot man’s new, upgraded best friend. Try it now to see if this could be the best video slots online for you. 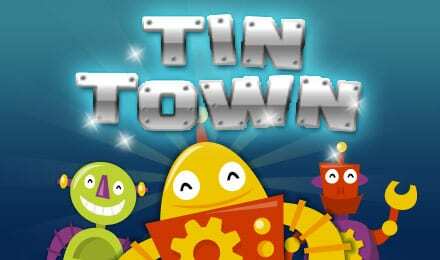 Welcome to Tin Town, a place with colourful friends – each with their own use. Between Dancebot and Dogbot the bonuses are unmatched. The available opportunities within the Free Spin round allow for players to find large wins quickly and effectively. The graphics style for Tin Town follows a childlike 16-bit aesthetic, reflecting the technological heavy themes. The most useful robotic pal is by far Dancebot, not only acting like a wild, but he also adds additional bonus cash out for each winning combination giving an additional chance for a huge cash jackpot. Speaking of jackpots, why not also try our fluffy favourites jackpot?